Now in the heat & humidity of our NE Texas summers I hate to fire up the canner so I often opt for refrigerator pickles instead. Hey, whip ’em up & toss the jar in the fridge to let them get all pickley! What’s not to love??!! I’ll let them sit in the fridge pickling for about a week or so and then bring them out of the fridge as a cooling condiment on a hot day with our supper. 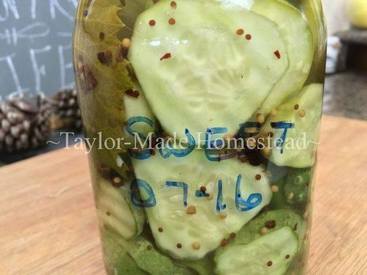 My husband really prefers sweet pickles and I do love my recipe for sweet pickle brine so I always make it up myself. I’ve found an easy way to whip up a quart of sweet pickles for the refrigerator using a recipe that has just the right amount of sweetness for him without being too sweet for me.